When Lydia (Erin Moriarty) gets in trouble with a group of drug dealers, she seeks out help from her estranged ex-con father Link (Mel Gibson). He will do whatever it takes to make sure she survives. "Blood Father" is directed by Jean-François Richet and is based on a novel by Peter Craig, who also wrote the screenplay along with Andrea Berloff. It stars Mel Gibson as Link, an ex-con and recovering alcoholic who is doing his best to walk the straight and narrow path since being released from prison. His path hits a fork when his estranged daughter Lydia, played by Erin Moriarty, shows up asking for money to help her disappear. She has just had an incident that has now made her the prime target of a drug cartel, and she is now desperate for help. Link has no real relationship with his daughter as he has spent the vast majority of her life in prison. Lydia also ran away from home a short time ago, where she lived with her mother, but was unhappy in her upper class suburban life. Despite all of this, Link will do anything for her and is willing to go to great lengths to keep her safe. 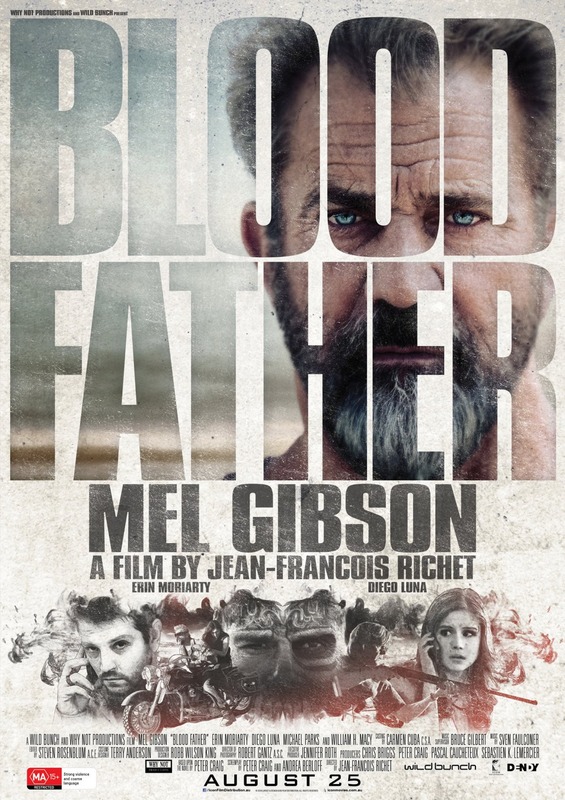 "Blood Father" is a fairly short, straightforward movie clocking in at under 90 minutes. It is the same action-packed story we've seen hundreds of times before, and yet it still manages to have a lot of exciting, tense moments with some very thrilling conflicts. It feels raw and gritty, almost a throwback to the action days of old as Mel Gibson and his estranged daughter traipse through the desert trying to get her as far away from those after her as possible. To go along with the action, there is a father/daughter bonding narrative where, in a short time, these two relative strangers who happen to be related by blood have to get to know one another for the first time. It is clear Link loves his daughter and he is trying to make amends for not being there for her, but Lydia is pretty ambivalent to the notion of wanting anything from her father other than money and a place to crash, until it all goes to hell. Link clearly carries guilt about not being there for her and partially blames himself for her predicament, like she would have turned out differently if he wasn't such a loser criminal. Though "Blood Father" doesn't have a deep, substantial script with heartfelt dialogue or even a ton of plot, it still manages to be a breezy, action-packed film full of blood and intense chases. It's as simple as A-B-C: the characters are attacked, they go on the run and eventually have to make a stand for their lives. Despite Mel Gibson's personal craziness, his acting here is fitting and manic, a very "him" type of part. It's sure to keep action lovers entertained.